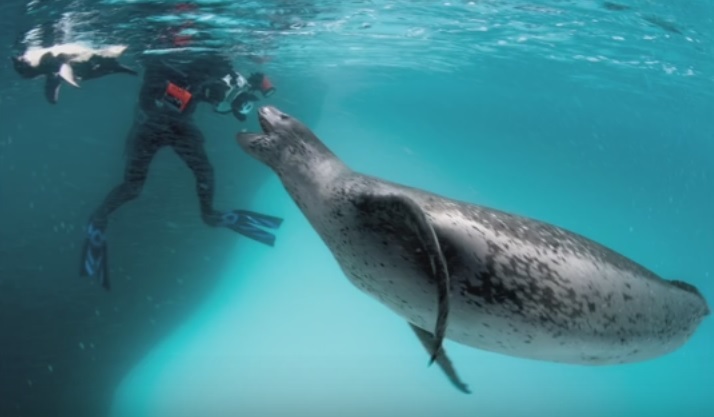 Paul Nicklen, scuba diver and photographer for National Geographic, encounters a massive leopard seal as well as his fears. Leopard seals are one of Antarctica’s most viscous predators. 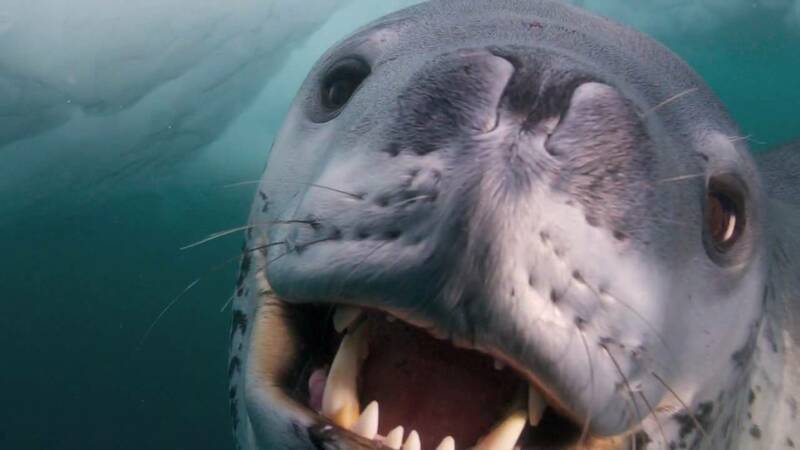 A photographer for National Geographic Magazine was on a quest to dive with as many leopard seals as possible. As luck would have, it he and his team came across a huge leopard seals. Apparently it was the opportunity of a lifetime and he just couldn’t pass it up. He jumped in and swam up to it with shaky knees and what happened next was scary , but amazing in many ways. We have to give Paul Credit for having the courage to overcome his fears in order to take advantage of this opportunity to photograph these predators. Especially after what happened to him. needless to say, most divers would not be willing to take the risk. Paul’s description of what the sea lion did to his head and camera would be enough for me as well as most scuba divers to abort the mission. Watch the following video narrated by Paul to see how his his experience turned out. Loved the videos, but don’t want to travel to Antarctica to see them up close. Thank you for pointing me to his story. Fascinating! Thanks for posting this, I came here to do the same and make sure everyone got his story. Humans must not go near these or any other creatures in the ocean as many will follow and the delicate balance of the world ocean will be disturbed!! When next human will come this wonderfull creature will be friendly and trusty but this next human may kill it for whatever bizarre reason and this is how relationship between humans and creatures of the wild is!!! Hi Sasha I came across a leopard seal on a beach in Tasmania, I thought it may be injured or dead. When I was about 5m from it, it turned around and opened it’s mouth literally looked like it’s head split open to reveal dozens of large sharp teeth. These animals would be quite capable of killing humans if they needed.